I wrote here and here about how we recently received a check from our mortgage company for $807 which represented the overage in our escrow account. We have lots of plans for that money and I thought I’d chronicle the different ways we make it stretch. After putting $264 aside to cover the $22 a month increase in our mortgage payment (yes, our mortgage payment went up even though we had an overage in our escrow account for this past year), we have $543 left to play with. 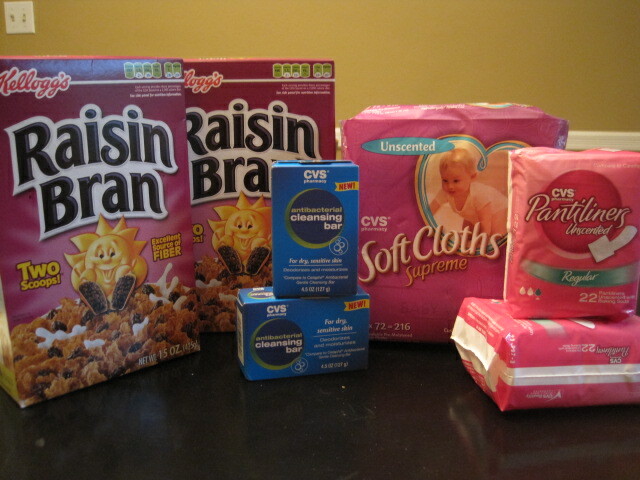 We took 10% of that and donated it to a relief agency helping victims of the Chilean earthquake. 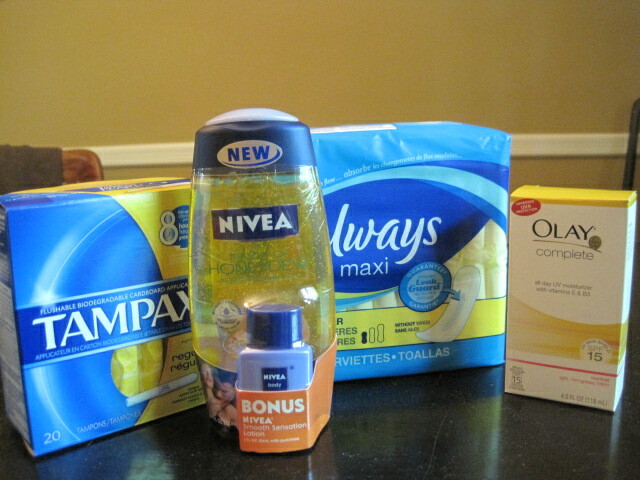 That left us with $489. Yippee! They came with the house and we’ve been happy enough with them for the 5 years we’ve lived here, but recently they’ve posed a safety hazard. Charlie has taken to standing on top of the back of the couch, grabbing the pull strings on the middle blind, and jumping onto the couch. This terrified us because we imagined he could get the strings wrapped around his neck (it would take a little effort, but it was definitely in the realm of possibility). 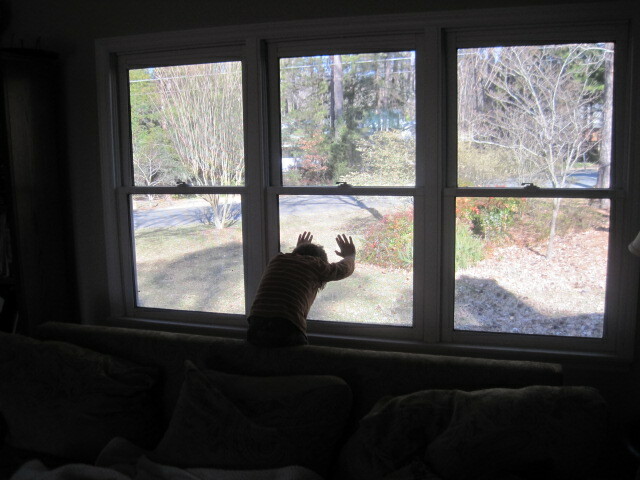 No amount of pleading begging screaming urging seemed to persuade him to stop, so the blinds had to go. Each panel was just $7.99. We debated about whether we wanted a color and/or a pattern on the curtains. 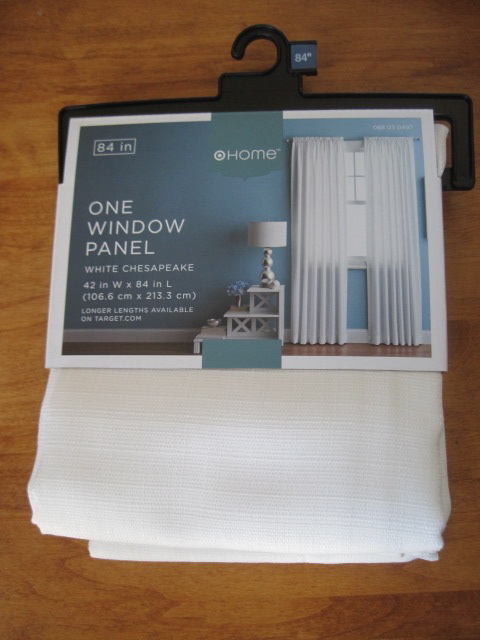 Ultimately we chose these white panels because not only were they inexpensive, but since they’re white, they can easily be laundered and even bleached, if necessary. 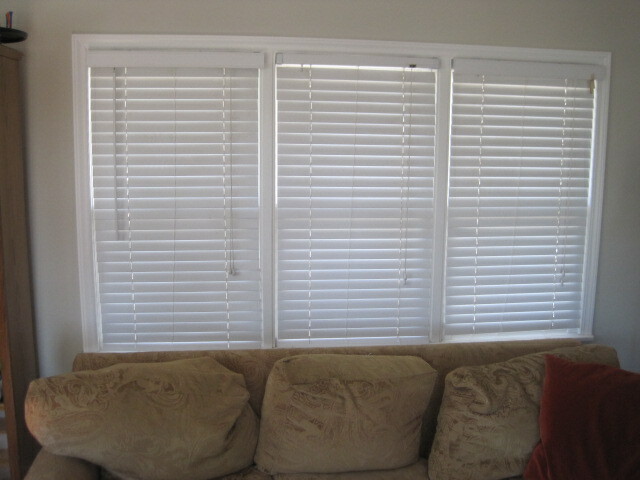 Then we bought an extra long curtain rod for $19.99. I thought it would be a good idea to wash the panels because if they were going to shrink, it would be best if they shrunk before we measured and hung the rod at a height we liked. So I washed them and then decided to iron them. 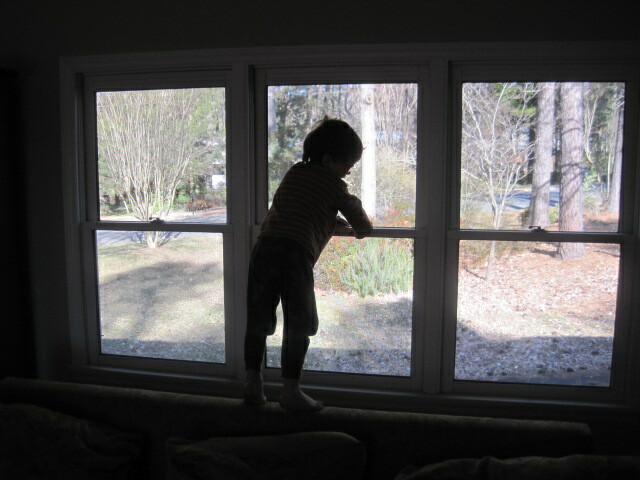 And that’s when our fun curtain project took a turn for the worse. 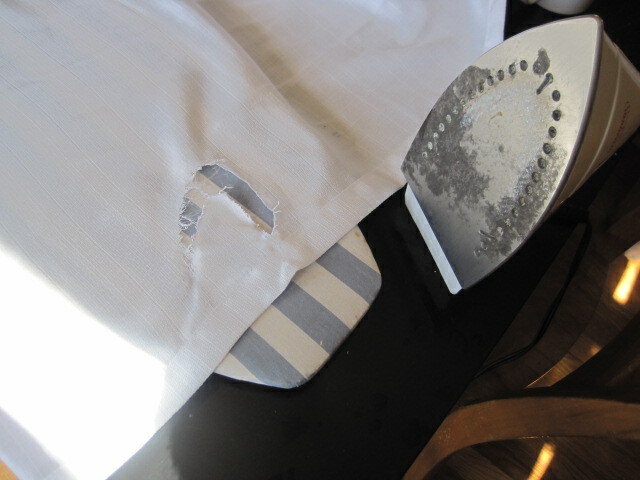 This, Mom, is why I don't iron. Well, shoot. I swear the iron was on the curtain panel for less than five seconds. But I guess these curtain panels aren’t the highest quality fabric (what a surprise at $7.99 each). So I went back to Target and bought another panel. Mark borrowed a power drill from our neighbor (I’m beginning to think we should invest in our own power drill given how much we end up borrowing our neighbor’s. By the way, thanks Jim!) 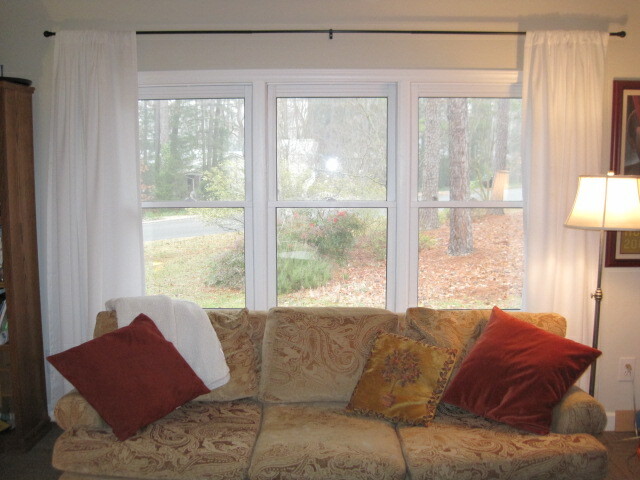 and installed the curtain rod. We deliberately hung the curtains wider than the windows so that when the curtains are pulled all the way open they don’t obstruct the sides of the windows. We love them. 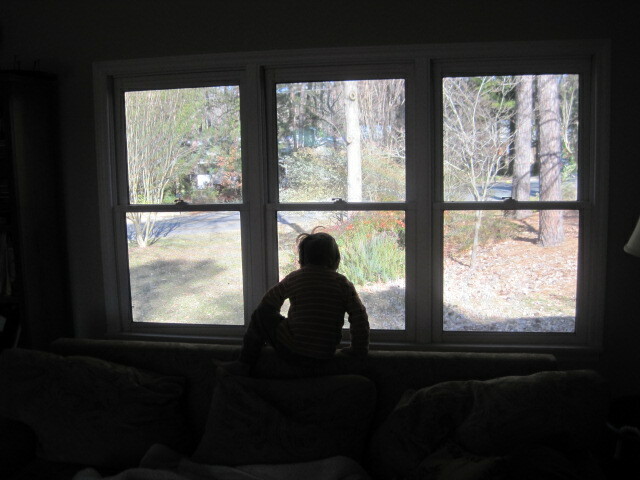 The blinds had been fine, but only fine. The curtains look great. I can’t believe what a difference they make to the feel of the room. Not bad. If we subtract that from our $489, we still have $425.61 left. I’ve been knocking ideas around about how to make use of that extra white panel — the one whose edge the iron ate. By the way, that curtain panel did not go down without a fight; it left the iron in a very ugly shape. 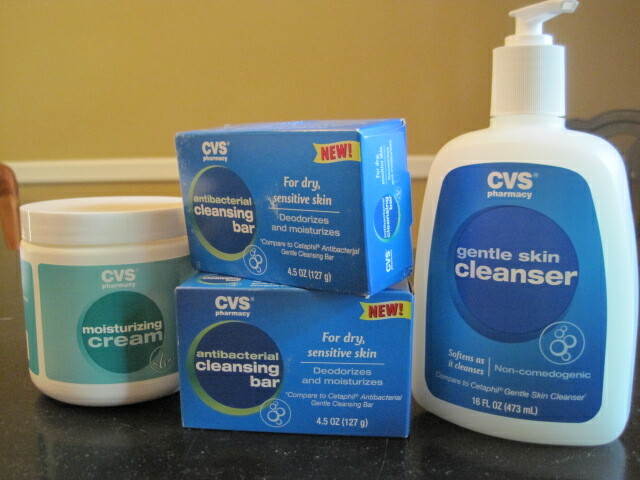 So in my next post, I’ll detail how I went about trying to clean the iron after my little fiasco. Late last summer I began a small landscaping project in our front yard. It is, alas, an ongoing project because the money for the landscaping budget went to fix the car unexpectedly. Though the project seems discouragingly never-ending, it did get me interested in composting because I bought quite a lot of compost to add to the soil to prepare it for my new plants. 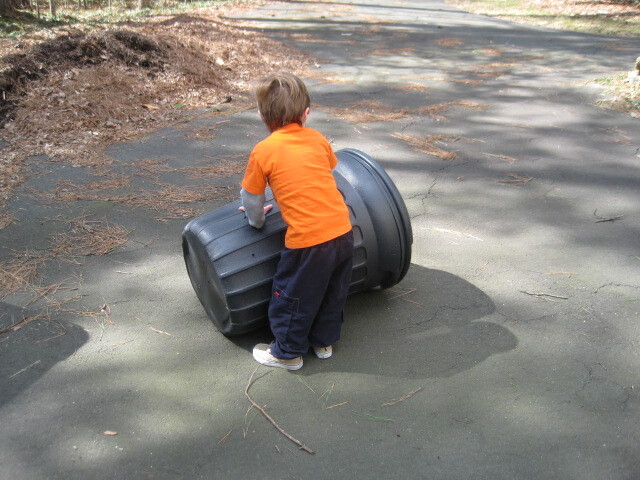 Our town actually sells very nice compost bins, but they cost $50 each. 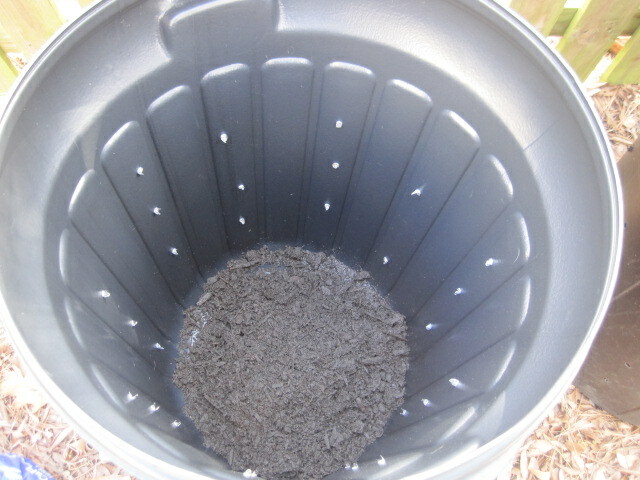 You can buy a lot of compost for $50, so I decided to try to make my own bin. Last fall, I did just that. 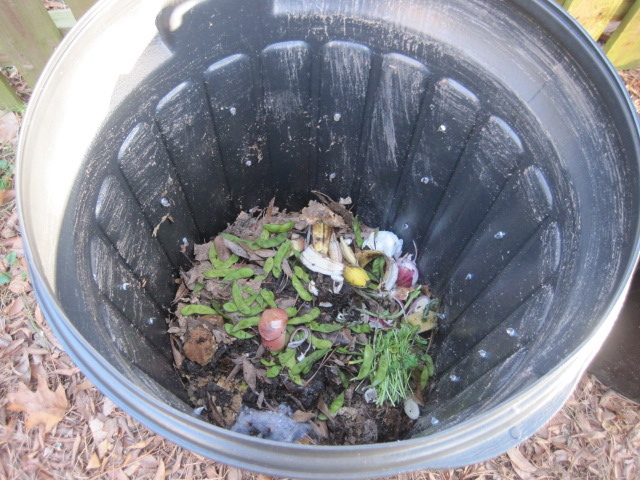 The bin is pretty full now and since compost needs some time to “rest” so everything can finish decomposing, I decided to make another bin for all the food scraps and other compost-able things I collect in the meantime. Since the first bin is working out so well, I made the second bin just like the first. 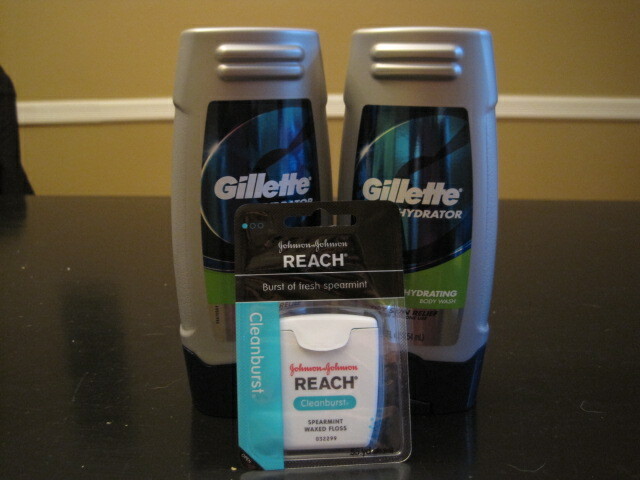 Here’s how I did it. Put the trash can on newspaper before drilling the holes. I forgot. I had to pick up a lot of little bits of black plastic from the deck. 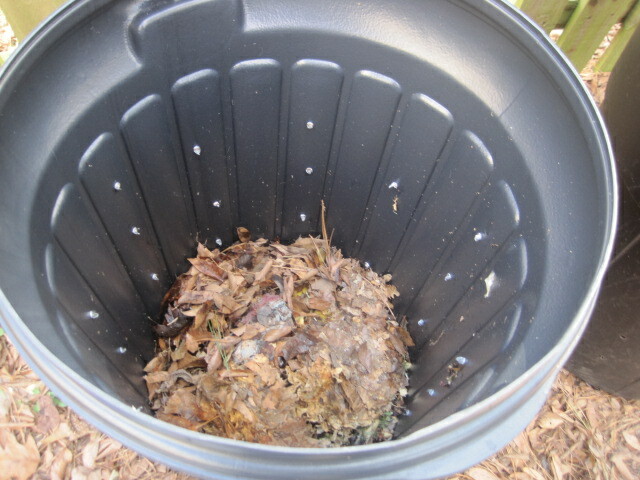 The compost bin needs air to aid in decomposition, so drill holes in the bottom, sides, and lid of the trash can. I drilled about four holes in the bottom, but I’m regretting that now and think I probably should have drilled more. 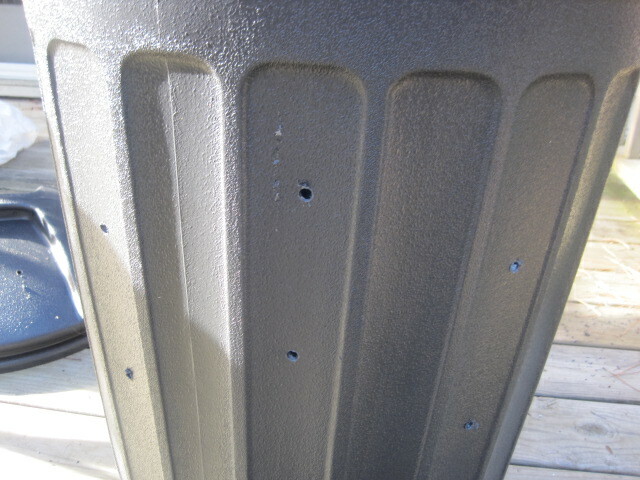 It’s just that the plastic on the bottom of this bin was very thick and hard to drill through so I gave up after four. Having lots of holes in the bottom helps with drainage, which is a good thing. Four holes probably isn't enough -- drill more. 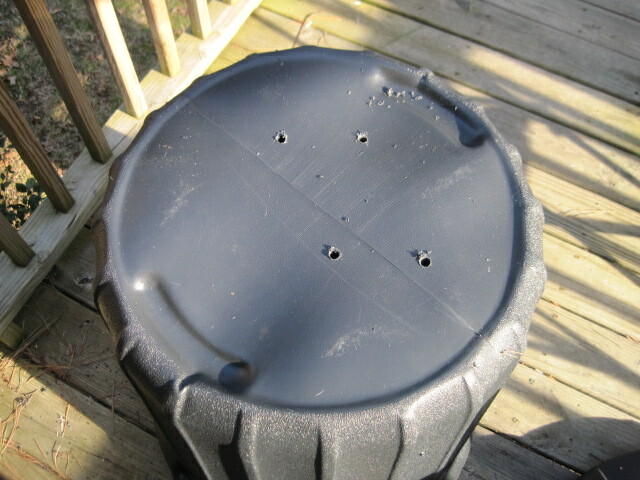 Then I drilled about 25 holes all around the trash can and 8 holes in the lid. Drill holes all around the bin. 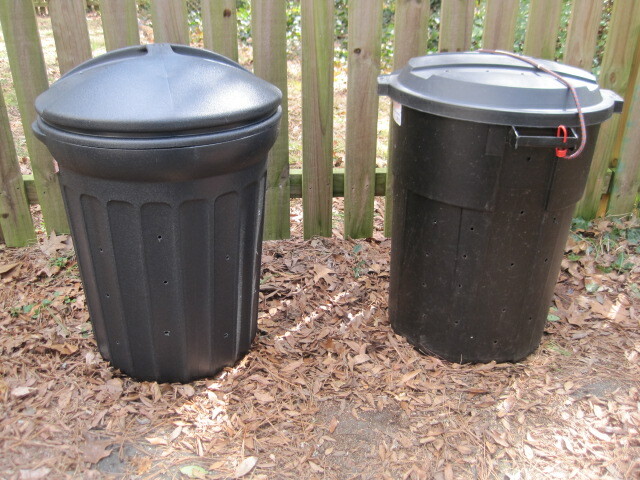 Then I placed the new compost bin next to the one I made last fall. Don’t they make a pretty pair? The new bin is on the left. 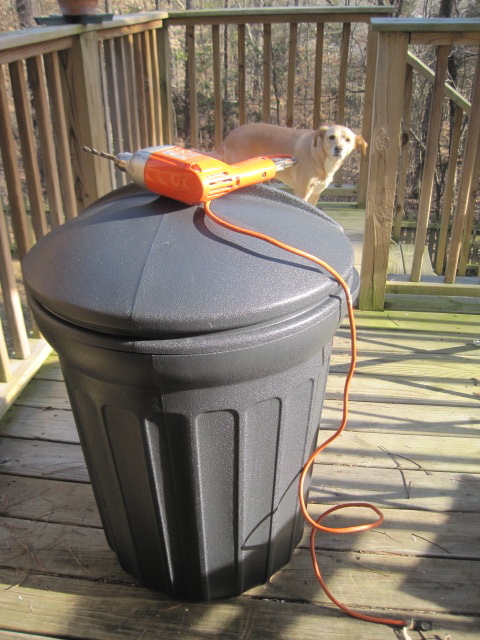 I put a bungee cord on the old bin when I made it last fall because I read that critters might get interested in the contents of the bin which creeped me out. But I’ve never seen a critter anywhere near the old bin and the new bin’s lid fits quite snugly, so I didn’t bother with this one. I’ll change my mind at the first sign of a critter though. So how much money did I save by NOT purchasing the town’s $50 bins? power drill: FREE, since I borrowed it from my neighbor. 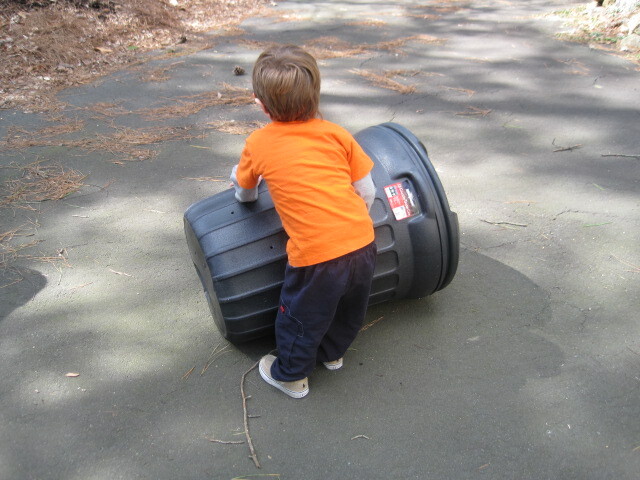 The best little compost mixer around. 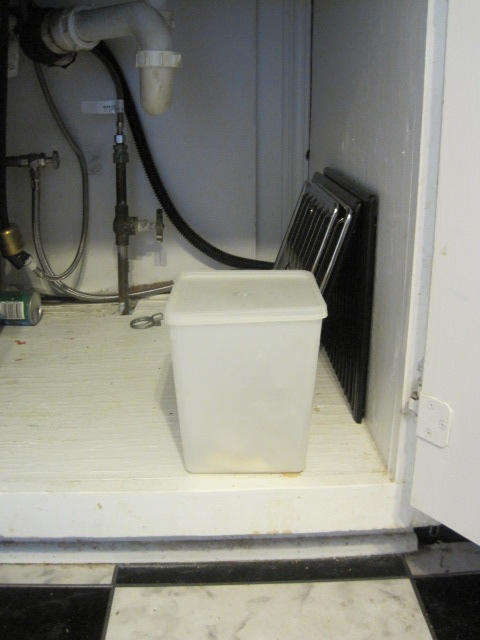 I was having trouble with the bin not draining properly which made the contents too moist, so I drilled several more holes in the bottom of the bin (and even a few more holes in the sides) which seems to have solved the problem. 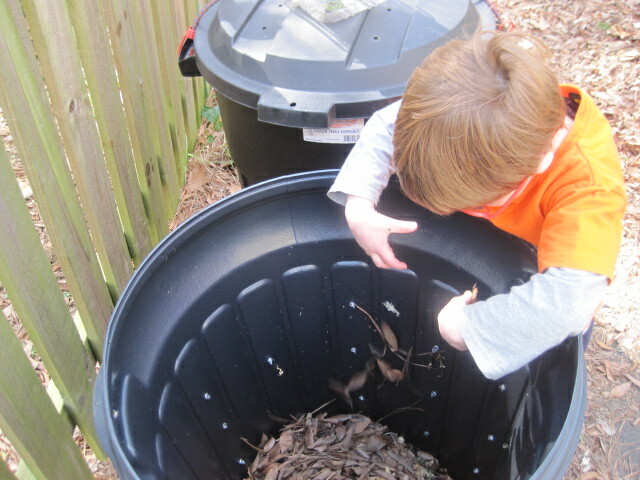 Also, if you’re interested, I’ve written several posts on composting which you can read here, here, and here.